The Mother and Infant Home Visiting Program Evaluation-Strong Start (MIHOPE-Strong Start) began in 2012 to gauge the impact of evidence-based home visiting delivered during pregnancy. It is part of the Strong Start for Mothers and Newborns initiative launched by the Centers for Medicare and Medicaid Services (CMS) to address poor birth outcomes. CMS, in partnership with the Administration for Children and Families and the Health Resources and Services Administration, established MIHOPE-Strong Start because of home visiting’s promise for disadvantaged mothers. The study includes 2,990 families enrolled in 66 local programs that use either the Healthy Families America or Nurse-Family Partnership home visiting model. MDRC conducted the evaluation in collaboration with JBA, Johns Hopkins University, Mathematica Policy Research, and New York University. Families who received at least one home visit had an average of eight visits over 4 months before the woman gave birth. Families received a similar amount of home visiting as found in prior studies, including those that found reductions in the percentage of infants born preterm or with low birth weights. Among women who received at least one home visit, those who exhibited risks for compromised birth outcomes (such as being of a younger age or being a smoker) received the same number of visits and participated for similar lengths of time, on average, as women who didn’t demonstrate such risks. 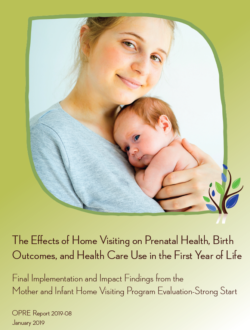 The home visiting programs in the study had no statistically significant effect on the evaluation’s focal outcomes, including families’ prenatal behaviors, birth outcomes, or health care use in the first year after birth. Effects of the home visiting programs in the study are not greater for higher risk or for lower risk families or depending on how the programs were implemented. Home visiting did not have larger effects on prenatal behaviors, birth outcomes, or health care use after birth for any subgroups of families, nor do the effects vary across local programs or by evidence-based model.